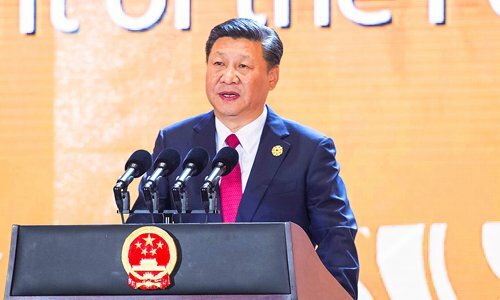 Chinese President Xi Jinping on Friday called globalization an "irreversible historical trend" in his APEC keynote speech, reaffirming China's commitment to an open economy and multilateral trade system. Xi's speech came after US President Donald Trump's "America First" address where he vowed to protect the US from being taken advantage of. "Over the last few decades, economic globalization has contributed greatly to global growth. Indeed, it has become an irreversible historical trend. Against the backdrop of evolving global developments, economic globalization faces new adjustments in both form and substance. In pursuing economic globalization, we should make it more open and inclusive, more balanced, more equitable and beneficial to all," Xi said. Xi stressed the importance of an open economy that benefits all. "Openness brings progress, while self-seclusion leaves one behind," Xi said. "We should put in place a regional cooperation framework that ensures consultation among equals, wide participation and shared benefits, build an open Asia-Pacific economy and promote trade and investment liberalization and facilitation." He said the building of a Free Trade Area of the Asia-Pacific (FTAAP) is the long-cherished dream of the business community in our region. Chen Dingding, a professor of International Relations at Ji'nan University, told the Global Times that "China has benefitted greatly from the multilateral trade system. The country joined APEC in 1991 and with the help of APEC, China's economy further liberalized and eventually became a member of the WTO." Chen said Xi's APEC speech is very much in line with his report to the 19th Communist Party of China (CPC) National Congress. "Xi has repeatedly voiced his opposition to protectionism at multiple occasions. This shows China pays great attention to openness and globalization at the very top," Chen noted. Meanwhile, Trump's speech on Friday sent a drastically different message. "I am always going to put America first, the same way I expect all of you in this room to put your countries first," Trump said. Trump said the US will no longer pursue multilateral trade agreements "that tie our hands, surrender our sovereignty and make meaningful enforcement practically impossible." "The current trade imbalance is not acceptable," Trump said. "I do not blame China, or any other country, of which there are many, for taking advantage of the US on trade. If their representatives are able to get away with it, they are just doing their jobs." "I wish previous administrations in my country saw what was happening and did something about it," Trump said. Li Haidong, a professor at China Foreign Affairs University's Institute of International Relations, told the Global Times on Friday that "the two different speeches highlight the different arrangements of China and the US on a trade mechanism involving the Asia-Pacific region. In general, China's stance on multilateral trade system and an open economy is supported by a majority of the countries in the region." Li said it is not uncommon for two countries to have divergent opinions but "when China and the US have such divergence, other countries need to choose what to do based on their own national interest." Analysts said Trump's opposition to a multilateral trade system could hinder the development of FTAAP. Also in Da Nang a planned meeting of leaders of the 11 countries in the Trans-Pacific Partnership (TPP) failed to materialize on Friday, Reuters reported. The leaders were set to meet in the afternoon on the sidelines of the Asia-Pacific Economic Cooperation (APEC) summit to discuss how to push ahead with the TPP, after the United States pulled out this year. "The meeting did not happen, work remains to be done and that's what's happening now," a Canadian official said.